The other day I was in the mood for a sausage and peppers hoagie. Lacking a hoagie bun, I went with my next favorite carb – pasta! One of the best things about this was that I didn’t have to buy anything at the grocery store to make it! As it’s getting close to CSA season, I am in use-it-up mode. Have to make room in the freezer and pantry for this year’s stock! Last year, we received more green peppers than I knew what to do with, so I simply stuck them whole in a ziplock freezer bag. Pulled them out, and while a little soft from freezing (I wouldn’t want to eat them raw), they were perfect for cooking. I always have onions in the cupboard and found this 1/2 bag of rigatoni in my pasta drawer. Another staple in my freezer is some sort of sausage. For this I used a smoked fatty. A smoked fatty (google it) is simple pork sausage smoked. My smoker (Amazon links are affiliate links) Masterbuilt 20051311 GS30D 2-Door Propane Smoker has several shelves and whenever I smoke anything, I always make sure that one shelf is filled with fatties! All I do is buy pork sausage in the tubes, tear off the plastic wrap and sit them on the shelf – couldn’t be easier. Then I vacuum seal them one in each bag, and I am ready for their smokey goodness. If you don’t have a smoked fatty in your freezer (I feel sorry for you), just use any sort of cooked, smoked sausage. 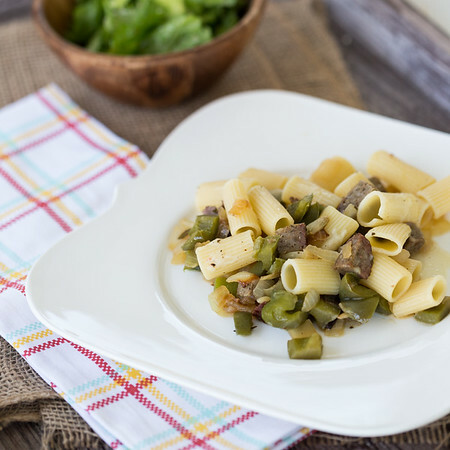 This was a quick and easy weeknight meal made from pantry, freezer, and fridge. Note – I did have some fresh rosemary from my herb garden, it lasted all winter! 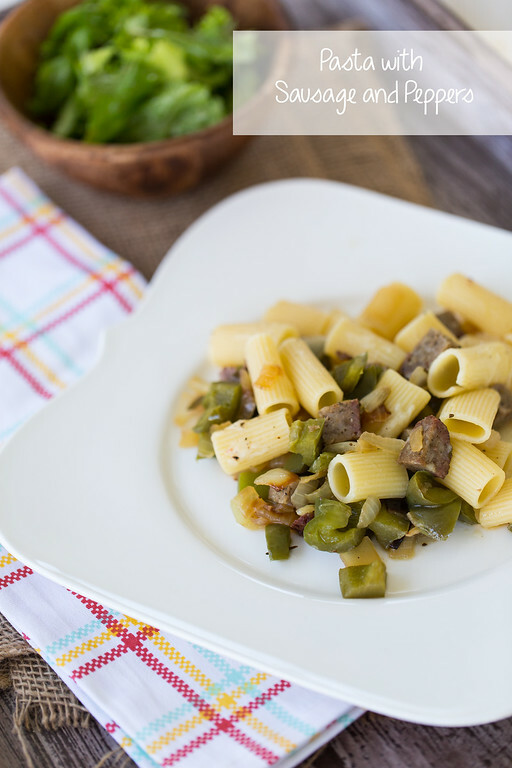 The classic sausage and peppers turned into a pasta dish! Even better, it can be on the table in under 30 minutes! Heat olive oil over medium heat. Add onions, garlic, and rosemary. Saute until onion is golden. Add green peppers and sausage. Saute for about 5 minutes. Cook pasta in boiling, salted water per directions. Reserve 1/2 cup of pasta water before draining. Add pasta water to pan and scrape up any browned bits. Add pasta and Parmesan cheese and toss to combine. Season with salt and pepper and drizzle with a little fresh olive oil (if desired) before serving. My husband loves pasta and is always wanting me to find new pasta recipes! Thanks! I want to try this soon! I love pepper (although I like red peppers much better). This will be in my next hit list! This looks good, but what in the world is smoked Fatty? I have never heard this before? Anything pasta is DELICIOUS!! This is twice in as many days that I’ve heard someone mention a smoked fatty (which never fails to make me smile). This sounds delicious! 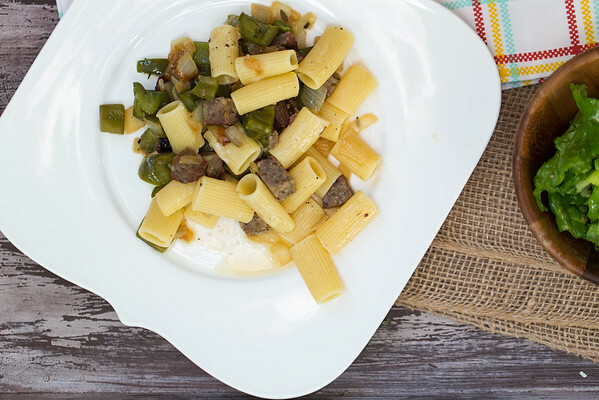 I love sausage and pepper hoagies too – great idea making it into pasta! Looks like the perfect weeknight meal. Smoked fatty, love that name! We had this same meal last night for dinner, but with turkey Italian sausage. Will give the smoked option a try. You have the best food photos…seriously, I’m not a big fan of sausage, but suddenly I am craving a bite of this dish!! Coming from Across the Pond as I do, what pray tell, is a hoagie? Patty, you’ve taught me something new today–and I’m glad. I have (unsmoked) sausage in the fridge and it’s amazing how much flavor a small amount can provide to a dish. I’m starting to see the light (literally) at the back of the freezer as I use up more and more goodies in anticipation of the coming CSA season. I too have had a glut of peppers at times–I’ve never tried just chucking them whole into the freezer (I’ve done that with cherry tomatoes, though!). I’ve put mine up chopped though and it’s so easy to toss them, frozen, right into the pan to cook. Thanks for a great idea–I’m craving the comfort of pasta today! Such an easy weeknight dinner!